Join us for a Festival within a Festival — the Film Festival within the Frankie Manning Centennial Celebration. Leslie Li will show selected clips from The Kim Loo Sisters documentary-in-progress prior to the full screening of The Savoy King: Chick Webb and the Music that Changed America. 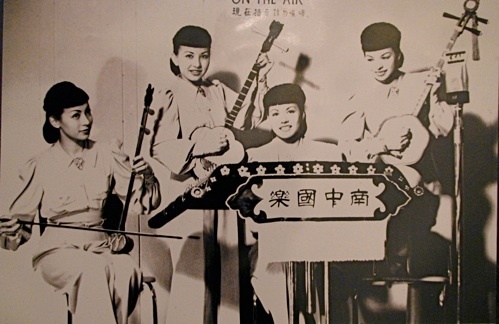 The Kim Loo Sisters were dubbed “the Chinese Andrews Sisters” and the obstacles they overcame in their ascent to stardom sheds light on the experience of many Asian Americans during the Swing Era (1935-1945). George Gee and his Orchestra presents an evening of swing music and a special preview of the Kim Loo Sisters documentary film. The third installment of Big Band First Fridays at spacious Dance Manhattan Studios includes a tribute to The Kim Loo Sisters by the 17-piece George Gee Swing Orchestra and features guest vocalist Le Zhang, DJ Chris Lee, and guest baritone saxophonist Adam Lee, former Beijing big band leader. During the first intermissions, filmmaker Leslie Li will give a special presentation of her documentary The Kim Loo Sisters. Admission: $20 cash only at the door. *The band starts playing at 9:30 p.m. Please join author and first-time filmmaker Leslie Li for a screening of her hour-long film-in-progress — Kim Loo Sisters: Portrait in Four-Part Harmony — a documentary about four sisters — daughters of a Chinese ‘paper son’ and a Polish refugee — who overcame poverty and prejudice to become a popular American jazz vocal quartet in the 1930s and 40s. Spanning nearly a century, the Kim Loo Sisters’ recollections include the Jazz Age, when they cut their theatrical teeth in kiddie revues in their hometown of Minneapolis; the Great Depression, which they spent crisscrossing the country following the various vaudeville circuits; and the Second World War, during which they performed in Broadway musicals and Hollywood movies. The quartet became a trio when one “Kimmie” left the act to marry the son of the vice president of China and witnessed the Chinese Revolution first-hand — but not before her three sisters joined the USO to entertain American and Allied troops stationed in Europe during the “good war.” Their remarkable story — both on stage and off as well as their lives pre- and post-Kim Loo Sisters — adds a vivid chapter to contemporary Chinese-American history and makes a persuasive argument for the power of sisterhood. This event is free and open to the public. Please RSVP if you plan to attend, as seating is limited. Time: 2:15 p.m. — 4:15 p.m.
Time: 1:30 p.m. — 3:30 p.m.
Time: 5:30 p.m. — 7:30 p.m.
Time: 9:30 a.m. — 11:30 a.m.
Time: 2:00 p.m. — 4:00 p.m.
Time: 1:00 p.m. — 3:00 p.m. Contact: RSVP is not required. Time: 2:30 p.m. — 4:30 p.m.
A discussion of the film and Q&A will follow each screening. Light refreshments will be served. This project is made possible in part with public funds form the Manhattan Community Arts Fund, supported by the New York City Department of Cultural Affairs and administered by Lower Manhattan Cultural Council.